Memphis Hill performing at the 2016 Deutschtown Music Festival. The Deutschtown Music Festival has been eating magic beans. Close to 250 bands will perform during this year’s free two-day music festival, an event that was also named the “Best Music Festival” in Pittsburgh by the City Paper in 2016. Last year the event garnered 189 bands, and during its first year there were only 46 bands, said Cody Walters, co-founder of the event. Now in its fifth year, the weekend will consist of 33 venues and 36 stages around several Northside neighborhoods including: Historic Deutschtown, Spring Garden and Troy Hill as well as Allegheny Commons East Park. Family-friendly daytime activities will include face painting, balloon sculptor, bounce houses, the city Art Cart and more than 20 food trucks and vendors. As in year’s past, free school-bus shuttles will transport attendees from North Shore parking lots and the Northside T station to the various venues. “From big outdoor stages to intimate Northside venues, we are proud to bring in the best of local and national artists — and continue to represent the Northside’s commitment to creativity, hospitality, and fun for all ages,” said co-founder Ben Soltesz in a press release. New this year are two pop-up stores selling Pennsylvania-produced beers and wines, operated by Pittsburgh Winery, at 522 East Ohio St. and at Artist Image Resources, 518 Foreland St.
Joe Nadberazny, one of three members of The Danzas, said this will be the groups third time performing at the festival. This year they will be playing outside at 2 p.m. at Huszars, 627 E. North Ave.
Photo courtesy of Joseph Nadberazny. 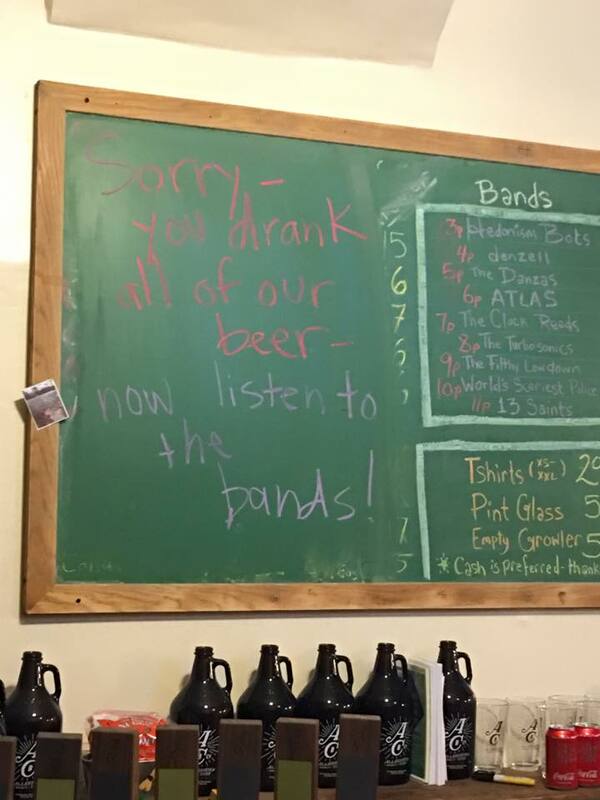 The Allegheny City Brewing chalkboard after running out of beer at the 2016 Deutschtown Music Festival. Last year, Nadberazny said the band was located at Allegheny City Brewing and about two thirds of the way through the show the brewery ran out of beer that was set aside for the festival. “They had a chalk board with the beer available written on it, and slowly I saw them erasing beer until all it said was, ‘Sorry, you drank all of our beer, now listen to the bands!’” Nadberazny said. “As difficult as this is, I absolutely love doing,” Twyman said. This year after DMF, Walters said there will be a Saturday series of musical performances every weekend for 10 weeks starting July 23 and running through September 23. Dubbed the Deutschtown Summer Series, a band or solo act will perform at Arnold’s Tea on East Ohio Street from 6 to 7:30 p.m. and BYOB will be allowed. Walters said patrons of the series are encouraged to purchased liquor or beer from Wigle Whiskey, Allegheny City Brewing or the Wine & Spirits for the early show to kick off their Saturday night. For Friday’s schedule, click here. For Saturday’s schedule, click here. The 2017 Deutschtown Music Festival is a non-profit event sponsored by the Northside Leadership Conference. Other sponsors include First National Bank, One Northside, Highmark, Allegheny Health Network, Iron City Beer, Crown Royal, Rivers Casino and Auberle. Media sponsors are WYEP-FM, WESA-FM, and WDVE-FM.